LG blamed a "challenging quarter for mobiles" for the $117.27 million quarterly loss posted by its mobile unit, even as the company posted slightly higher year-over-year revenues across its other businesses. Samsung similarly reported strong overall earnings--primarily from its semiconductor segment--while its mobile unit turned in revenues and profits better than last year but still below its Galaxy heyday back in 2014. LG noted "weaker than expected premium smartphone sales and increase in component costs" for its mobile segment losses, despite the release of its new G6 flagship phone. Since 2014, Samsung has been hit hard by a series of Galaxy S flops that attracted more negative reviews than new buyers, culminating in the mobile world's worst brand implosion ever suffered in last fall's Note 7 imbroglio. Samsung's earnings report noted that "Revenue/OP [operating profit] increased significantly driven by increased global sales of S8," but acknowledged that "shipments of mid to low-end smartphones declined." 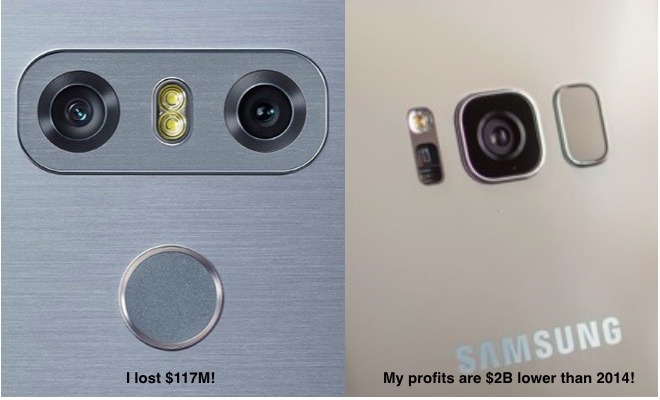 Further, the company noted that the profit bump from the S8 introduction would be short-lived, stating that in the next quarter "earnings are projected to decline QoQ due to increased marketing costs with the launch of new Note product, and reduced new product launch effect of S8." Apple's critics have long insisted that the iPhone-maker needed to start selling higher volumes of lower-end iPhones to compete in "market share metrics" with Chinese producers, none of whom actually make very much money producing large quantities of mid to low-end phones. However, Apple has continued to maintain world-leading profitability even as it dramatically boosted its iPhone shipments numbers since the introduction of 2015's premium iPhone 6 and 6 Plus models. In contrast, Samsung has relied on shipping larger numbers of lower priced phones, a far less effective strategy for generating profits and one that has made it much easier for Chinese companies to steal away sales. Like Samsung, Chinese brands have also achieved shipping larger numbers of phones than Apple, but none have come anywhere close to matching Apple's profitability. Last quarter, Apple's iPhone sales earned more than 5.4x as much as Samsung Mobile, and more than 15 times as much as Huawei; BBK Electronics' subsidiary brands Oppo and Vivo; Xiaomi and ZTE put together. Apple is slated to announce its earnings for the second calendar quarter of 2017 next Tuesday, August 1.